having the same size opening does not necessarily mean that the same amount of light falls on the film. Rather, the amount of light admitted by a given opening depends on the focal length of the lens. In other words, if the iris diaphragm opening is 25 mm, it will expose the film only one-sixteenth as much on a 200 mm telephoto lens as it will on a 50 mm lens. Although expressed as a ratio (e.g., 1:4.5) in Europe for many years, in English-speaking countries, the diameter of the aperture is usually expressed as a fraction of the focal length, e.g., f/4.5, or 1/N. Consequently, our 50 mm lens with a 25 mm opening is a nice fast f/2 lens, while our 200 mm telephoto lens with a 25 mm opening is frustratingly slow at f/8. This gives one some insight into why fast telephoto lenses are large, bulky, and expensive- a modest 200 mm telephoto lens with a maximum aperture of f/2 has an opening of 100 mm, or about 4 inches! The beauty of the f-stop system is that, at a given F-number, every lens will allow exactly the same amount of light per square centimeter to fall on the film. Thus an exposure of 1/100 second at f/5.6 will be exactly the same no matter which lens or film size one uses. For exposure to halve or double between stops, the f number must change by the square root of 2, or 1.414. The numbering of the stops is therefore arranged in a geometric sequence based on powers of the square root of 2.
f/1.1, 1.6, 2.2, 3.3, 4.5, 6.3, 9, 12.5, 18, 25, 36, 50, 71, 100, etc. f/1, f/1.4, f/2, f/4, f/5.6, f/8, f/11, f/16, f/22, f/32, f/45, f/64, f/90, f/128, etc. The origins of the concept of the F-number date back to the mid-19th century. In 1867, Sutton and Dawson defined the “Apertal Ratio” as the ratio of the stop diameter to the focal length (i.e., 1/N), but used it only as an indicator of depth of field. In 1874, John Henry Dallmeyer stated that “…the rapidity of a lens depends on the relation or ratio of the aperture to the equivalent focus…” However, it was to be many years before there was universal agreement on a mathematical scheme to formalize this principle. Clearly, the situation with respect to lens aperture at the turn of the century was extraordinarily confusing. Fortunately, the majority of these schemes are largely of historical interest and are rarely encountered. 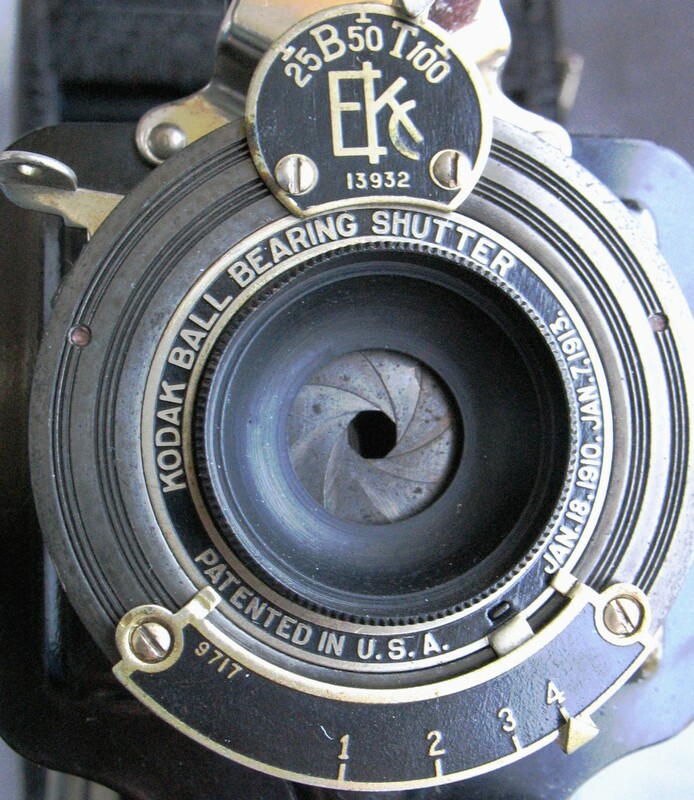 Modern day camera collectors need only concern themselves with three aperture systems: The modern f-stop method, the “U.S.” system, and a very simple numerical aperture scheme used by Kodak on their cheapest folding cameras. This table does contain the seeds of our modern, streamlined system of f-stops in the first column. Even though the numbers are not neatly rounded off in the manner to which we are accustomed (2, 2.8, 4, 5.6, 8, 11, 16, 22, 32, 45, and 64) this column is recognizable as f-stops as we know them. Thus f/16 becomes U.S. 16, the intersection point of the two systems, and f/4 is designated U.S. 1. Consequently, the U.S. system numbers correspond to settings on the modern f-stop scale, and a lens with U.S. markings can be used in the same manner as a conventionally-labeled lens by counting up and down from f/16 (see table below). Once again, note that the U.S. and modern systems intersect at f/16, and therefore the U.S. system can be used readily by counting stops up and down from this point..
Konig, Mischa. 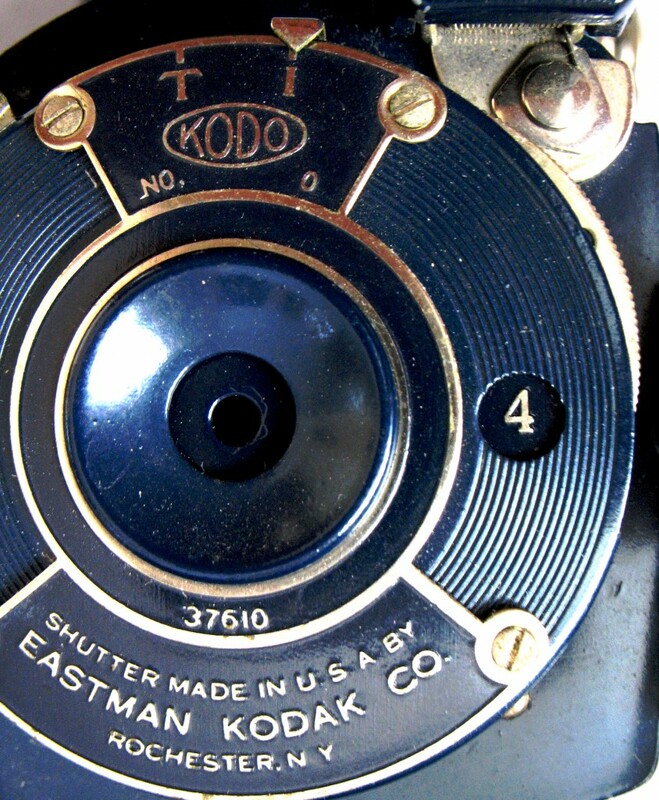 Kodak Classics: Kodak Folding Cameras (Includes discussion of f-stop systems). http://kodak.3106.net/index.php?p=213. 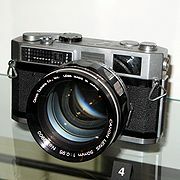 “Uniform System of Lens Apertures.” http://www.sizes.com/tools/uniform_system.htm. This entry was posted in Working with Vintage Cameras by randcollins. Bookmark the permalink. Looked at your site – nice work! 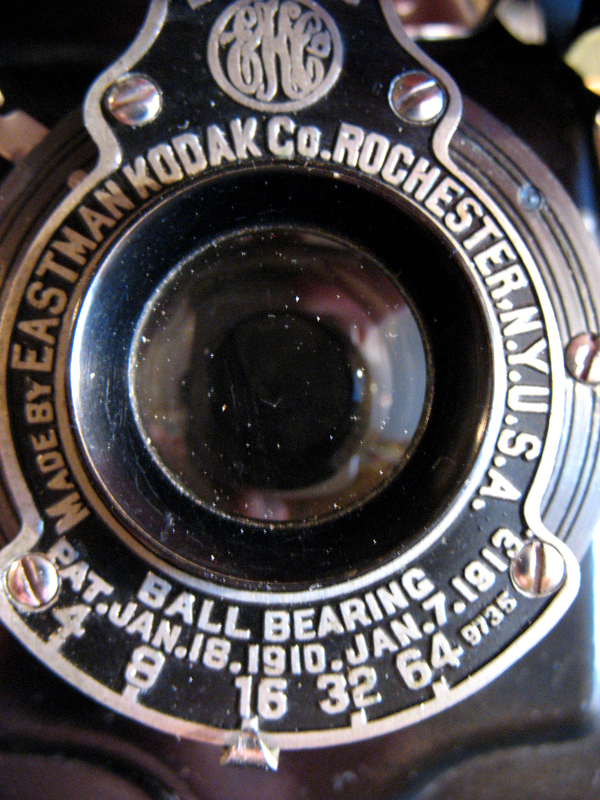 For interest you might try a camera with a Rapid rectilinear lens such as an old 1914-1920 Kodak. They are cheap and you might be surprised by the quality.